Senior boys and Leaders from Avon Battalion went to watch filming for Channel 4’s Countdown at Media City in Salford. It was a great experience for all to see how the recording of a TV programme works. 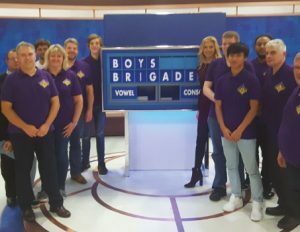 After the recording the group posed in front of the famous Countdown letter board with number genius and host Rachel Riley with the letters spelling out ‘BOYS BRIGADE’.